If you live in Thailand and have a 12 month marriage visa, 12 month retirement visa or you have a work permit then you have to report to Thai immigration every 90 days. This is to ensure that they have your address on record in the event that they need to find you. There are fines of 2,000THB plus 200 THB per day if you do not report however when you need to extend the visa again the next year they will look to see if you have reported every 90 days the year before. Should you have not done this they might not extend you 12 month visa again as you have not fully complied with the immigration rules in Thailand. You make the notification by registered mail. – front page showing name / surname / Passport No. If you need any further help then speak to us online about your 90 day reporting and how best to avoid problems at your next visa extension in Thailand. 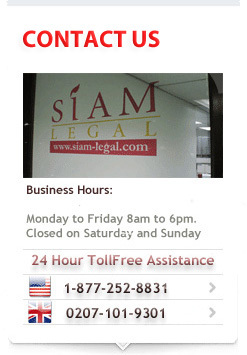 You can also visit in of our law offices in Thailand for more information.